Nowhere in Africa is wildlife more plentiful than in the Masai Mara Game Reserve. It is fabled for its concentration of gazelle, antelope and their natural predators, the big cats - majestic black-maned lion, satin-coated leopard and the shy, swift-footed cheetah. Elephant and buffalo abound and there's a good chance of seeing rhino. At the southern end of this 1,510 sq. 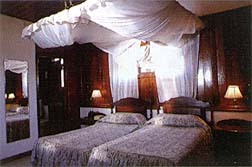 kms paradise and right in the path of the annual migration of wildebeeste and zebra, lies Keekorok lodge. There's always plenty of activity around the waterhole but during the migration, the lodge is enveloped by the swarming mass of animals. One need hardly venture from the ground to game view. From the verandah and from Kiboko Bar at the end of the raised 300 m. walkway, there is plenty to see. One unfortunate zebra met its end right in front of the dining room, providing supper for a pride of hungry lions and 'live' entertainment for enthralled lodge visitors. Accommodation at Keekorok is in bungalows, single storey blocks and in comfortable shaded chalets. The liberal use of cedar wood, pink and grey Sand River stone and other indigenous building materials offset the green lawns and colourful bougainvillea. For those wishing to fly into Keekorok, an excellent light aircraft service operates between Nairobi, Mombasa and Keekorok. 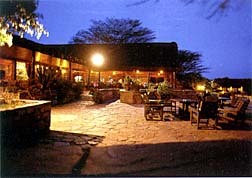 Early morning and evening game drives can be arranged at the lodge. Of course there is no better way to see the animals and countryside than to drift over the plains in a hot air balloon at dawn, culminating in that famous champagne-style breakfast. After a day in the fresh air, the excitement of game spotting and a refreshing dip in the swimming pool, the ritual of sundowners by the roaring log fire in the lounge, heralds an evening full of traditional Maasai dancing, cultural and wildlife lectures and videos and yet anotherof those remarkable Keekorok dinners. And long after you and the game have gone to bed, our staff are busy preparing to greet you at sunrise with the traditional and incomparable 'block' smile.